Sometimes life is made more complete by stumbling across information, which in hindsight makes you wonder how you previously lived life without the knowledge. A modest example if I may. During the 2000 Olympic Games in Sydney, a total of 90,000 condoms were distributed to the 10,000 athletes in the Olympic village. Obviously identifying this as some sort of dubious record to be broken, Athens managed to hand out 130,000 in 2004. Now I am a little perplexed. Were there a whole lot of olympic athletic events being shown on television late at night after Mrs GOF had safely tucked me into bed? I am going to keep a close eye on it this year. Has the inspirational Olympic motto of Faster-Higher-Stronger been modified to include "Relentless"? I want the Olympics permanently moved to the Vatican City to eliminate all this sin and iniquity. 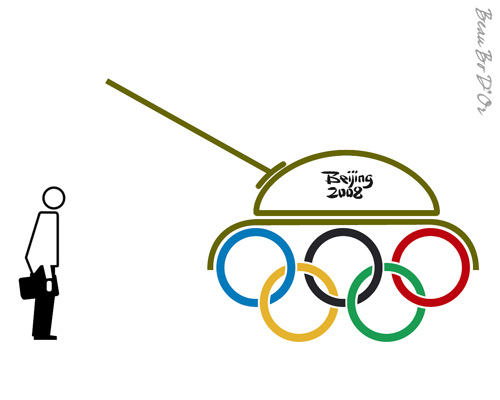 And I always did wonder what that Olympic logo was all about. Now my life is complete. Posted in Uncategorized and tagged olympics, sin. Bookmark the permalink. Thank you to my dear Globet for finding and sending this to me. You are one of my golf balls. full. They agreed that it was. again if the jar was full. They agreed it was. they remained, your life would still be full. everything else; the small stuff. the golf balls first; the things that really matter. inquired what the wine represented. Posted in Uncategorized and tagged globet, philosophy. Bookmark the permalink. Your blogger has had an involvement in agriculture and horticulture for the past 40 years. Farming is an honorable profession. Australian agriculture has much to be proud of in terms of supplying the nation and the world with food. Nevertheless its record of caring for the environment has often been less than optimum. As a nation during the past 200 years we have introduced plagues of rabbits, cane toads, prickly pear cactus, and bureaucrats. During the 1960's and 70's Australian farmers literally went berserk clear- felling huge expanses of native bushland in order to establish farms. As a result, much of the continents fragile soil was eroded either by wind or water. Huge dust storms swept across the country carrying precious topsoil and depositing it in the oceans. Today, Australias Murray-Darling river system is a disgrace to the nation. Farmers have been given permission by past Governments, to completely block its tributaries to provide irrigation water for crops totally unsuited to Australias semi-arid regions. (eg cotton and rice), and been given almost unlimited pumping rights for other crops. During 2007 the Darling river stopped flowing completely as did the mouth of Australias largest river, the Murray, allowing saltwater inundation to destroy fragile flora and fauna habitats. It was convenient for officials to blame this occurrence on an extended drought. The truth I suspect is that Government officials over the past 50 years have failed to recognise water as a finite resource and regulate its usage accordingly. Additionally many thousands of hectares of good farming land in Eastern and Western Australia is now unusable because of salination…..the result of unsuitable irrigation practices. P.A. Yeomans (1905-1984) was a geologist turned farmer during the 1940's and 1950's. (The writer would like to apologise for any factual errors as he is relying on memory) He was a man who devised sustainable systems for farming long before anyone else saw the necessity of doing so. His geological experience enabled him to design a farm planning model almost totally opposite to conventional agriculture at the time. He was derided by Government officials and many conventional farmers alike. Yeomans designed the "Keyline System" of farming detailed in his book "The Challenge of Landscape". Tradition had it that farm water storages be placed at the lowest point of a farm then pumped back uphill to irrigate. Yeomans found out that by placing smaller water storages as high up on the property as possible, and often on ridgelines, he could divert rainfall runoff from the valleys out to the ridges using contoured and grassed water channels. This system prevented soil erosion, increased absorbtion of rainwater into the soil, and reduced the need for subsequent irrigation, which, if required could be done by gravity flow from his higher water storages. It was revolutionary thinking, which he proceeded to prove and put into practice on 3 large grazing properties in New South Wales. Additionally he retained or planted wide strips of trees to improve the farms micro climate, when accepted practice was to bulldoze vegetation. He did not plough large areas of soil leaving it vulnerable to erosion, but deep- ripped his grazing land to open up compacted soils and gradually integrate organic matter into them, increase rain penetration, and improve micro-biological activity in the soil. He judged his success by observing the huge increase in earthworm numbers in his soils. The Permaculture movement of the world now recognise these practices as part of their system of sustainable agriculture. P.A Yeomans should be remembered as an innovator and intelligent custodian of our fragile earth. In the 21st century, farmers can no longer afford to ignore the lesson he showed the nation 50 years ago. The bureaucrats who failed to recognise the value of his work should now take a look at the Murray and Darling Rivers, and bow their heads in collective shame. P.A. Yeomans, you deserve the greatest honour for being an outstanding caretaker of mother Earth. A new scientific truth does not triumph by convincing its opponents and making them see the light, but rather because its opponents eventually die. Posted in Uncategorized and tagged agriculture, yeomans. Bookmark the permalink. Occasionally GOF has trouble with pesky critters who invade his vegetable garden, or neighbours who impinge upon his solitude. In Australia you need to have an acceptable reason to own a firearm, have no criminal record, and pass a written safety examination to be granted a licence to use one. Unfortunately an annoying neighbour does not apparently fall within the parameters of "acceptable reason". However, being confronted with angry and hungry feral pigs on a regular basis does. They are not easily negotiated with, and "shoo" does not immediately send them into rapid retreat. A 410 solid projectile, on the other hand, does. I do not ever feel the need to take my firearm to town for a couple of good reasons. Firstly, no-one else carries a gun around town so there is no imminent threat to my wellbeing, and, secondly I prefer my own warm bed to that of the police lockup. There seems to be an increasing awareness in the US that Charlton Heston (1924-2008) and the gun lobby's dream of guns for the masses is turning into a nightmare. How many innocent children need to be gunned down in American schools before the issue of gun ownership is addressed. I have considerable difficulty understanding the logic behind the right of every citizen to bear arms and its benefit to society. Is it similar to vaccination? If I carry a little pistol, will it give me immunity against somebody elses bigger weapon? 1. Charlton and the gun lobby are wrong. 2. Perhaps in the 21st century, guns no longer provide an adequate protection factor, and upgrading and expanding an individuals arsenal is long overdue. Thus, civic duty has driven me to manufacture a very small personal nuclear device, with just sufficient power to eliminate impediments to the happiness of the individual. It resembles a matchbox and can easily be carried in the pocket or handbag, avoids detection by electronic systems, and is a perfect accessory for the harrassed individual, gang member, nutter, or corporate executive wishing to deter a hostile takeover bid. It can be remotely triggered by a modified electronic car locking button, although it will be wise to clearly identify which one you use for your car. Triggering the device whilst it is still in your pocket has adverse repercussions on your health. It is kind to the environment and leaves no metallic residue or evidence of your involvement. Everything within a 2 metre cubic volume will be vaporised. Think of it as progressively cleaning up the littered world we live in. Order now! Phone within the next 20 minutes and receive a free mini cluster bomb attachment for even greater personal protection and safety. How does one go about applying to be awarded the Nobel Peace Prize? Posted in Uncategorized and tagged guns. Bookmark the permalink. Up until the age of 30, like most, I was invincible. Poor health was something that happened to old people and that was no concern of mine. At 31, I presented my skinny little carcase to a late middle age doctor (late, as in advanced, and not as in deceased) for treatment of a clunking shoulder joint. His response was to stand up, move his body like a hula dancer, and perform his own orthopedic percussion……indeed with full skeletal orchestration, then suggest "and you think you've got problems Sonny", charge me twenty bucks, and told me to come back when I was sick. I never went back, either because I was never sick, or perhaps I felt there was a remote possibility his bedside manner needed to be refined a little. Now, 28 years further on, I am myself an accomplished conductor of my own bodily concerti. However, on a daily basis I give thanks for the good health that has enabled me to live a physically active life, and, so far, avoid ailments common in middle age. I have subscribed to the theory that the human body has an enormous capacity to heal itself given the appropriate inputs for the body and the mind. is my guide, and yet his advice is also not infallible. After publishing How to Cancer Proof your Body, he apparently died of prostate cancer, even though he was well into his eighties at the time. Thus, for all of us, we have to allow a certain amount of fate to interrupt our good intentions, practices, and intellectual understandings. For me the time has come for acceptance that not everything in my vehicle can be repaired and renewed. Some bits and pieces have a limited life span. Much is a reflection of poor maintenance and the contaminated fuel I have put in it over the years. The wheels have not as yet fallen off…but I can no longer deny that a couple of wheel nuts are loose and they can no longer be tightened again. Much of the bodywork is damaged, and yet each dent and scratch allows me to reminisce and appreciate the journey we have travelled together. I am forever thankful to my faithful jalopy for all the good times that we have had, and find great peace and comfort just being in it. It is not a pretty sight, yet there is no way I would ever want to have it restored or modified. Its character would be lost forever, and I cannot afford the downtime…..we've got some travellin' to do. Posted in Uncategorized and tagged health, jalopy. Bookmark the permalink. Most great industries of our world have a recognised Founding Father or Mother. Electricity would not be as it is without Edison and Tesla. David Buick invented enamel bathtubs before messin' about with automobile engines. So, who is the founding Father of the dairy industry? Which human genius was first responsible for sticking his head between the legs of a cow and sucking on a teat to satisfy his hunger and thirst. His identity appears to have been lost in the annals of history, so for the purposes of this piece of literary rubbish I would like to call him Alvin the Inquisitive. Before proceeding I would like to offer my partial curriculum vitae in an attempt to give some credibility to the verbiage that follows. I was raised on a dairy farm, studied dairying for 3 years under the legendary and dour "Chuckles" McKenzie whilst incarcerated at a somewhat reputable Australian seat of agricultural learning, and worked on dairy farms for a small part of my adult life. It may well be that during the last phase I was kicked in the head once too often by a cow in the dairy shed. Dairy milk is a truly great food. For baby bovines. Human milk is great for baby humans. As the young grow up they have a diminishing need to depend on milk for nutrition. Adults of both species have no need to consume milk after weaning, although in the case of humans it has been recorded that the male of the species occasionally maintains an enduring intellectual interest in, and appreciation of, the receptacles where the milk is produced. I am unaware if male bovines have similar thought processes. Thats an academic thesis opportunity awaiting some enthusiastic university student. We have been led to believe that milk is an essential food for human adults. Nonsense. Many ethnic peoples of the world do not consume other-species milk. They do not drop dead at an early age from cow-milk malnutrition.. All the useful food elements in milk can be obtained from other sources. It is 87% water, and by the time it has been pasteurised, homogenised, and otherwise farted around with, it is no longer the product that our hero Alvin found so satisfying. The dairy industry (at least in Australia) was nurtured by politicians after World War 2 in land resettlement schemes for the returning soldiers. Government subsidies were paid to farmers. As children we were forced at school to drink one half a pint of milk every morning before we were allowed into a classroom. Guaranteed consumption. Cows are one of Gods nicer inventions. She must have spent considerable time designing them. Dairy farmers are salt- of- the -earth people who sacrifice many of lifes pleasures by working long hours 7 days a week. No criticism of either is intended here. Dairy farming however, is an extremely inefficient use of the earths rapidly diminishing arable land and water resources. Cows belch and fart a lot producing greenhouse gases, and their untreated effluent often goes into waterways, and there is a slightly sordid side to the farming operations. For those living in cities and who may be unaware,…. 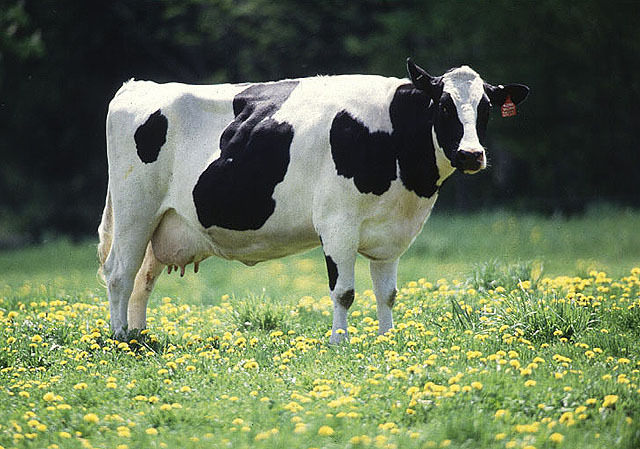 in order for a cow to consistently produce a lot of milk it has to give birth to a calf every year. Mother Nature in her wisdom does not give dispensations for dairy farmers and ensures that half of these calves are little boys. Bull calves are of no economic use to dairy farmers, given that no way has been found as yet to extract milk from them, so it has been common practice in this country for them to be, how can I phrase this delicately, cheaply euthanased, during their first 24 hours of life. Milk factory operators have also recently been embarrassingly exposed adding dubious ingredients to their "pure milk". Oh dear, who can we trust any more. Alvin the Inquisitive would be appalled. I think I'll go have a cafe latte and think about it all.